Before beginning to work on your website, you will first need to create a new project in your Divio Cloud - Control Panel. The project represents the entirety of your website, including files, settings, etc. Go to your Divio Cloud Control Panel, and hit the Add button followed by Project. Give your project an appropriate name, and decide whether it belongs in your Personal context or to an organisation. Select the Platform you want to use. You can also start a No Platform project to start with a very minimalistic Docker setup. Create a django CMS project (default), a Wagtail project or a plain Django project. Depending on your selection you may also see a Blank option. This indicates that Divio Cloud will setup a project with the most minimalistic settings. Select the frontend set-up you'd like your new site to use. Selecting a Blank Boilerplate may lead to errors on the deployment as necessary files for a successful deployment are missing. In this case you need to setup the project locally first, add the necessary files and then push via git to the test server. Hit Continue to go to the next screen. It is highly recommended to choose a subscription to receive support from us. Please have a look at our plans to decided on the best subscription for your needs. Our sales team is at hand to advice you on the best choice. Divio Cloud offers different regions where your website can be hosted in. Depending on your subscriptions you may choose to host anywhere in a continent, down to the exact country. Contact our sales if you need to have your own region. This section allows you to custom tailer your application to its required needs. 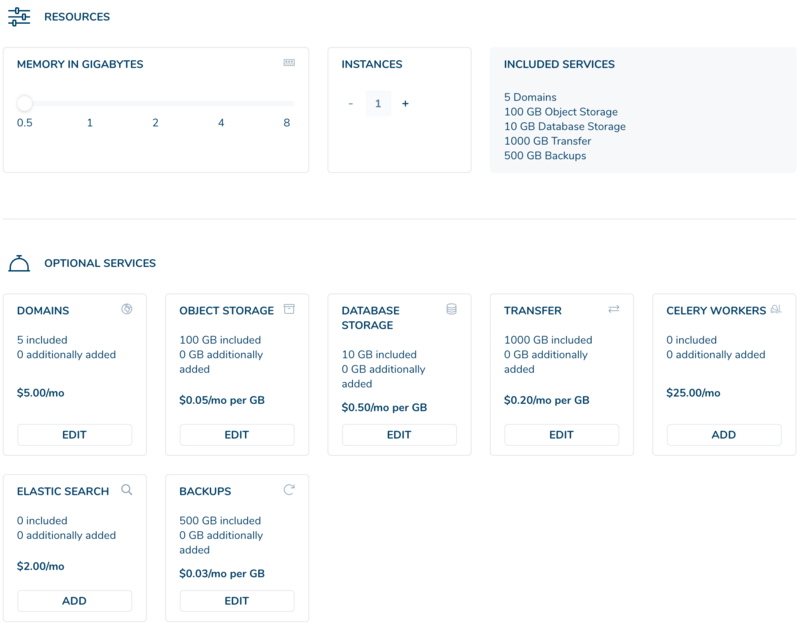 Do you need more memory, instances or disk space, how many domains will you redirect to this application, do you need elastic search etc. Your subscription can be changed at any time post creation. So if you are not sure yet about the consumption adapt it as you go. If you'd like to have an overview of the different options and potential costs, consult our sales team. Your Project is now set up and ready to customise! The next screen that you will see is your Project’s dashboard. It shows you interactive guides on several key functionalities of the Divio Cloud. Alternatively have a look at our fast support articles.